When Vivaldi joined the staff of the Ospedale della Pietà, probably late in 1703, it was as an instrumental teacher—of stringed instruments, primarily, though he would almost certainly have had to supervise wind players too. The Pietà, one of four charitable Venetian orphanages for women, was supported by the state and had a strong musical bias. From contemporary accounts we know that music played a prominent part in the daily curriculum of the Pietà, at least among the figlie di coro, as the musically active members of the orphanage were known. These girls, one French traveller recorded, were ‘trained solely to excel in music. Moreoever they sing like angels and play the violin, the flute, the organ, the oboe, the cello and the bassoon; in short, there is no instrument, nowever unwieldy, that can frighten them’. Between 1711 and 1729 Vivaldi published nine collections of concertos. They are, however, vastly outnumbered by those which remained in manuscript during the composer’s lifetime. By far the greater number of Vivaldi’s concertos are orchestrally based works in which one or more soloists provide contrasting texture with that of a larger body, usually of strings. Substantially different from this normal late-Baroque concerto pattern, on the other hand, are the twenty-two chamber concertos which Vivaldi composed for a variety of instrumental combinations. In these pieces the composer gives all parts other than the continuo an obbligato role but brings them together for the ritornellos. Thus, any given group, ranging in size from three to six players, provides not only the solo element but also the orchestral one. 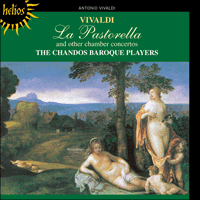 Within the limits imposed by these chamber music resources Vivaldi achieves a rich variety of tonal colours with transparent textures stemming, at least in part, from an informed knowledge of the instruments for which he was writing. Vivaldi’s chamber concertos cannot be dated with any certainty; nor do we know for whom they were written. Lacking this information we may suppose that he produced them for his pupils at the Pietà, perhaps during the late 1720s and 1730s when, furthermore, a growing interest was being shown in the transverse flute. The first known instance where Vivaldi wrote for this instrument is in his opera Orlando (1727). Although Bach, Telemann and several French composers explored the chamber concerto medium, Italian composers other than Vivaldi appear to have ignored it. In this sphere, as in so many others, Vivaldi combines melodic invention and fine craftsmanship with a beguilingly attractive tonal palette giving each and every one of his chamber concertos its own distinctive, colourful character. The means by which he achieves this are both varied and resourceful. The opening movement of the Concerto in G minor, RV105, for treble recorder, oboe, violin, bassoon and continuo is dominated by busy bassoon figures in the ritornello sections whilst the solo or concertante episodes are shared among all the instruments, singly or in different groups. The middle movement is a gentle dialogue in binary structure for recorder and bassoon without continuo whilst the concluding Allegro, also binary in form, returns to a similar approach to the first with the solo episodes shared amongst the four protagonists. Two sources for the Concerto in D major, RV95 (‘La Pastorella’), are known. In his autograph score Vivaldi’s instrumentation consists of treble recorder or violin, violin or oboe, violin, bassoon and continuo. On the other hand a set of five manuscript parts in Manchester substitutes a cello obbligato for the bassoon. The outer movements have a sprightly, bucolic character; here, the solo episodes all lie in the domain of the recorder which joins the other instruments for the tuttis. The rhythm of the opening movement, evoking a rustic dance, calls to mind that of the initial Allegro of Vivaldi’s ‘Autumn’ concerto from The Four Seasons. The tender-spirited middle movement for recorder and continuo is in siciliano rhythm whose pastoral associations complement the subtitle of the work. The contrapuntal gigue which concludes the concerto also evokes an Arcadian setting. The obbligato parts in the Concerto in G minor, RV107, for flute, oboe, violin, bassoon and continuo are fairly evenly spread though with a slight emphasis on virtuoso violin figures in the initial movement. The Largo, in the rhythm of a siciliano, also occurs in Vivaldi’s Concerto in B flat for oboe and violin, RV548. The lyrical melody is shared between flute and oboe whilst violin and bassoon provide an accompaniment; the effect is one of Arcadian enchantment. The work concludes with a chaconne built upon an eight-bar ostinato bass. The sequence of variations is imaginatively handled by Vivaldi who introduces several virtuoso flourishes to the instrumental writing. This effective and somewhat haunting music possesses, perhaps, a mildly poignant character. The opening bars of the Concerto in C major, RV87, for treble recorder, oboe, two violins and continuo are arresting in that the brief Adagio introduction anticipates the main theme of the ensuing Allegro. Vivaldi thrusts his fertile melodic ideas amongst the four concertante parts which function both in a solo capacity and in varying groups. The melody of the slow middle movement is allotted to the recorder with continuo accompaniment. The robust conclusion is built upon a series of upwardly moving scale passages. As in the opening movement, the solo episodes are shared amongst the four melody instruments singly and in groups, though Vivaldi favours the recorder over and above the remaining parts in this instance. The Trio Sonata in A minor, RV86, for treble recorder, bassoon and continuo is unusual for its instrumentation. Vivaldi has chosen two melody instruments of a disparate character and which speak in widely differing registers. In some of his chamber concertos he used a similar grouping, as for example in RV105, but it is only in this musically well-sustained sonata that he fully explores the ranges and sonorities of the two instruments. In Germany, Telemann similarly paired a treble recorder with a bassoon, but in a full-scale concerto. Vivaldi’s layout is that of the four-movement ‘sonata da chiesa’ but elements of concerto style are present, especially in the structure of the two Allegro movements. In the second of the slow movements the recorder is treated as soloist and is accompanied with broken-chord figures by the bassoon. Most of the writing throughout demands virtuosity from the soloists. In the outer movements of the Concerto in D major, RV94, for treble recorder, oboe, violin, bassoon and continuo Vivaldi affords pride of place to the violin although the other instruments, notably the recorder, have a solo role to play too. The solo episodes of the first movement are vividly contrasted instrumentally, rhythmically, and melodically. The first belongs solely to the violin whilst in the second the recorder is dominant with oboe and violin interjections. Episode three is shared between violin and recorder, and in episode four the recorder plays a lyrical ‘cantilena’ to the accompaniment of violin arpeggios. The fifth episode highlights the violin once more, but with short tutti interruptions. The binary middle movement is entrusted to the recorder whose expressive melody is accompanied by arpeggio figures on the violin. The concluding movement begins with an energetic violin solo from which a powerful unison tutti develops. As the music progresses so, too, does the virtuoso role of the violin become increasingly apparent. Entre 1711 et 1729, Vivaldi publia neuf volumes de concertos, lesquels sont cependant largement éclipsés par l’immense volume de ceux restés inédits du vivant du compositeur. Les concertos de Vivaldi sont en majorité des œuvres pour orchestre et un ou plusieurs solistes, ceux-ci étant destinés à fournir des textures s’opposant à celles de l’ensemble plus vaste réunissant généralement les cordes. D’autre part, il existe à son catalogue vingt-deux concertos de chambre écrits pour des combinaisons instrumentales variées qui s’écartent considérablement de ces canons du baroque tardif. Dans ces pièces, le compositeur octroie à toutes les parties autre que le continuo un rôle d’obbligato et retrouve pour les ritornellos les cordes réunies. Ainsi, chaque groupe donné—allant de trois à six instrumentistes—fournit non seulement l’élément solo mais aussi celui orchestral. Dans les limites imposées par les ressources de cette musique de chambre, Vivaldi atteint une riche variété de timbres, avec des textures transparentes jaillissant, au moins en partie, d’une connaissance pointue des instruments pour lesquels il écrivait. Les Concertos de chambre de Vivaldi ne peuvent pas être datés avec certitude; pas plus pouvons-nous savoir pour qui ils furent écrits. Et l’absence même de cette information nous permet de supposer qu’il les destinait à ses élèves de la Pietà, peut-être durant la fin des années 1720 ou 1730, quand un intérêt croissant commençait à voir le jour pour la flûte traversière. La première occasion où Vivaldi écrivit pour cet instrument remonte à son opéra Orlando (1727). Si Bach, Telemann et plusieurs compositeurs français avaient exploré le genre du concerto de chambre, les compositeurs italiens, à l’exception de Vivaldi, semblent l’avoir ignoré. Dans cette sphère, comme dans bien d’autres, Vivaldi associe l’invention mélodique et un savoir-faire magistral à une palette tonale séduisante, donnant à chacun de ses concertos de chambre son caractère propre, sa couleur distincte. Il y parvient par des moyens pleins de variétés et de ressources. Le mouvement initial du Concerto en sol mineur, RV105, pour flûte à bec alto, hautbois, violon, basson et continuo est dominé par les motifs chargés du basson dans les sections ritornello tandis que les épisodes solos ou concertants sont divisés parmi tous les instruments, seuls ou répartis en différents groupes. Renonçant au continuo, le mouvement central est un dialogue tendre de structure binaire entre la flûte à bec et le basson tandis que l’Allegro conclusif, également de forme binaire, retrouve une approche similaire au premier mouvement, avec des épisodes solos répartis parmi les quatre protagonistes. Nous disposons deux sources du Concerto en ré majeur, RV95 («La Pastorella»). Dans sa partition autographe, l’instrumentation de Vivaldi consiste en flûte à bec alto ou violon, violon ou hautbois, basson et continuo. D’autre part, un recueil de cinq parties manuscrites disponible à Manchester substitue un violoncelle obbligato au basson. Les mouvements extérieurs sont de caractère enjoué, bucolique, les épisodes solos sont tous dévolus à la flûte à bec que les autres instruments rejoignent pour les tutti. Le rythme du mouvement initial évoque une danse rustique, et rappelle celui de l’Allegro initial du concerto «Automne» des Quatre Saisons. Le mouvement central pour flûte à bec et continuo, tendre et chaleureux, s’inscrit dans le rythme de sicilienne, dont les associations pastorales complémentent le sous-titre de l’œuvre. La gigue contrapuntique qui conclut ce concerto évoque également un paysage arcadien. Les parties obbligato du Concerto en sol mineur, RV107, pour flûte, hautbois, violon, basson et continuo sont réparties avec égalité entre les instruments, avec une légère emphase portée aux motifs virtuoses du violon dans le mouvement initial. Ecrit dans le rythme d’une sicilienne, le Largo apparaît également dans le Concerto en si bémol majeur pour hautbois et violon, RV548. La mélodie lyrique est divisée entre la flûte et le hautbois tandis que le violon et le basson les accompagnent. L’œuvre se conclut par une chaconne élaborée sur une basse obstinée de huit mesures. La série de variations est traitée avec imagination par Vivaldi qui introduit plusieurs embellissements virtuoses dans l’écriture instrumentale. Cette musique efficace et assez lancinante possède, peut-être, un caractère légèrement poignant. Les mesures initiales du Concerto en ut majeur, RV87, pour flûte à bec alto, hautbois, deux violons et continuo sont saisissantes en ce que l’introduction Adagio concise anticipe le thème principal de l’Allegro qui s’ensuit. Vivaldi lance ses idées mélodiques fertiles parmi les quatre parties concertantes qui fonctionnent aussi bien dans une capacité solo que dans des groupes changeant. La mélodie du mouvement lent central est dévolue à la flûte à bec accompagnée du continuo. La conclusion robuste est élaborée sur une série de passages en gammes ascendantes. Comme dans le mouvement initial, les épisodes solos sont répartis parmi les quatre instruments mélodiques tantôt seuls, tantôt combinés, même si Vivaldi marque une préférence pour la flûte à bec qu’il place en exergue, au-dessus des autres parties, par exemple. La Sonate en la mineur, RV86, pour flûte à bec alto, basson et continuo sort de l’ordinaire de par son instrumentation. Vivaldi a retenu deux instruments mélodiques de caractère disparate, parlant dans des registres bien différents. Dans certains de ses concertos de chambre, il exploitait des formations comparables, comme par exemple dans RV105, mais c’est seulement dans cette sonate, musicalement soutenue, qu’il a pu pleinement explorer l’étendu et les sonorités des deux instruments. En Allemagne, Telemann avait, de la même manière, accouplé une flûte à bec alto et un basson, mais dans un concerto. La disposition que Vivaldi a privilégiée est celle de la «sonata da chiesa» en quatre mouvements, tout en retenant des éléments du style concertant, en particulier dans la structure des deux mouvements allegro. Dans le second des mouvements lents, la flûte à bec, traitée comme soliste, est accompagnée par des motifs en accords brisés du basson. L’écriture fait constamment appel à la virtuosité des solistes. Dans les mouvements externes du Concerto en ré majeur, RV94, pour flûte à bec alto, hautbois, violon, basson et continuo, Vivaldi offre au violon la place d’honneur même si les autres instruments, notamment la flûte à bec, jouent aussi un rôle de soliste. Les épisodes solos du premier mouvement contrastent vivement du point de vue des instruments, du rythme et de la mélodie. Le premier est entièrement dévolu au violon, tandis que dans le second, la flûte à bec domine les interjections du hautbois et du violon. Le troisième épisode est partagé entre le violon et la flûte à bec et dans le suivant, la flûte à bec joue une cantilène lyrique sur un accompagnement en arpèges du violon. Le cinquième épisode met une fois de plus le violon en valeur, interrompu toutefois par les tutti. Le mouvement central binaire est dévolu à la flûte à bec dont la mélodie expressive est accompagnée par les motifs arpégés du violon. Le mouvement conclusif débute par un solo énergétique de violon à partir duquel se développe un puissant tutti. Au fur et à mesure que la musique progresse, le rôle virtuose du violon devient de plus en plus apparent. Zwischen 1711 und 1729 hat Vivaldi neun Konzertsammlungen herausgegeben, und noch viele mehr blieben zu Lebzeiten des Komponisten in Manuskriptform. Die meisten Konzerte Vivaldis sind Orchesterwerke, in denen ein oder mehr Solisten für Kontrast zu einer umfangreicheren, meist aus Streichern zusammengesetzten Gruppe sorgen. Wesentlich anders als diese normalen, nach spätbarockem Schema angelegten Konzerte sind dagegen die zweiundzwanzig Kammerkonzerte, die Vivaldi für viele verschiedene Instrumentenkombinationen geschrieben hat. In diesen Stücken gibt der Komponist allen Stimmen außer dem Continuo eine obligate Rolle, führt sie jedoch zu den Ritornellen zusammen. So trägt die jeweilige Zusammenstellung von drei bis sechs Musikern nicht nur das solistische, sondern auch ein Orchesterelement bei. Innerhalb der Grenzen, die das kammermusikalische Ensemble auferlegt, erzielt Vivaldi eine reiche Vielfalt an Klangfarben und transparente Strukturen, die sich zumindest teilweise seiner eingehenden Kenntnis der Instrumente verdanken, für die er schrieb. Vivaldis Kammerkonzerte lassen sich nicht mit letzter Sicherheit auf ein Entstehungsdatum festlegen, und wir wissen auch nicht, für wen sie geschrieben wurden. Auch ohne diese Information dürfen wir jedoch vermuten, dass er sie für seine Schülerinnen an der Pietà geschaffen hat, wahrscheinlich in den späten 1720er- und 1730er-Jahren, als man sich außerdem zunehmend für die Querflöte interessierte. Das erste Mal, dass Vivaldi für dieses Instrument komponiert hat, war unseres Wissens seine Oper Orlando (1727). Bach, Telemann und mehrere französische Komponisten haben die Gattung Kammerkonzert erkundet, doch außer Vivaldi scheinen die italienischen Komponisten es ignoriert zu haben. In diesem Bereich wie in so vielen anderen vereint Vivaldi melodische Erfindungsgabe und handwerkliches Können mit einer betörenden Klangpalette, und er verleiht jedem seiner Kammerkonzerte einen eigenen markanten Charakter. Die Mittel, mit denen er dies erreicht, sind sowohl mannigfaltig als auch einfallsreich. Der erste Satz des Konzerts in g-Moll, RV105, für Altblockflöte, Oboe, Violine, Fagott und Continuo wird von geschäftigen Fagottfiguren in den Ritornellpassagen bestimmt, während die Solo- bzw. Concertante-Episoden von allen Instrumenten getragen werden, sei es einzeln oder in verschiedenen Zusammenstellungen. Der Mittelsatz ist ein sanftes Zwiegespräch in zweiteiliger Form für Blockflöte und Fagott ohne Continuo, und das abschließende, ebenfalls zweiteilige Allegro zeigt mit Soloepisoden, die unter den vier Protagonisten aufgeteilt sind, ein ähnliches Herangehen wie das erste. Zwei Quellen liegen für das Konzert in D-Dur, RV95 („La Pastorella“) vor. In seiner autographischen Partitur sieht Vivaldi als Instrumentierung Altblockflöte oder Violine vor, Violine oder Oboe, Violine, Fagott und Continuo. Dagegen ersetzt ein in Manchester erhaltenes Manuskript mit einem Satz von fünf Instrumentalstimmen das Fagott durch ein obligates Cello. Die Ecksätze haben einen munteren bukolischen Charakter; hier sind die Soloepisoden allesamt in der Domäne der Blockflöte angesiedelt, die sich für die Tutti zu den anderen Instrumenten gesellt. Der Rhythmus des ersten Satzes, der an einen bäuerlichen Tanz gemahnt, ruft den des ersten Allegros in Vivaldis „Herbstkonzert“ (Die vier Jahreszeiten) in Erinnerung. Der feinfühlige Mittelsatz für Blockflöte und Continuo ist im Siciliano-Rhythmus gehalten, dessen pastorale Anklänge den Untertitel des Werks erklären. Die kontrapunktische Gigue, die das Konzert beschließt, beschwört ebenfalls eine arkadische Kulisse herauf. Die obligaten Stimmen des Konzerts in g-Moll, RV107, für Flöte, Oboe, Violine, Fagott und Continuo sind relativ gleichmäßig verteilt, nur dass im ersten Satz die virtuosen Violinfiguren ein wenig hervorstechen. Das Largo im Siciliano-Rhythmus kommt außerdem in Vivaldis Konzert in B-Dur für Oboe und Violine (RV548) vor. Die lyrische Melodie teilen sich Flöte und Oboe, während Violine und Fagott für die Begleitung sorgen; der Effekt ist der arkadischer Verzauberung. Das Werk schließt mit einer Chaconne, die auf einem achttaktigen Bassostinato aufgebaut ist. Die Art und Weise, wie Vivaldi die Variationen aneinander gereiht hat, ist einfallsreich, und er schiebt in den Instrumentalsatz diverse virtuose Passagen ein. Die wirkungsvolle, ein wenig sehnsüchtig klingende Musik wirkt vom Charakter her gelinde ergreifend. Die einleitenden Takte des Konzerts in C-Dur, RV87, für Altblockflöte, Oboe, zwei Violinen und Continuo bestechen dadurch, dass die kurze Adagio-Introduktion das Hauptthema des nachfolgenden Allegros vorwegnimmt. Vivaldi verstreut seine zahlreichen melodischen Einfälle auf die vier Concertante-Stimmen, die sowohl als Solisten als auch in unterschiedlicher Zusammensetzung als Gruppe fungieren. Die Melodie des langsamen Mittelsatzes wird der Blockflöte zugewiesen und hat eine Continuo-Begleitung. Der robuste Schluss ist auf einer Serie aufwärts strebender Tonleiterpassagen gegründet. Wie im Anfangssatz sind die Soloepisoden auf die vier einzeln oder in Gruppen spielenden Melodieinstrumente verteilt, nur dass Vivaldi in diesem Fall der Blockflöte gegenüber den anderen Stimmen den Vorzug gibt. Der Triosonate in a-Moll, RV86, für Altblockflöte, Fagott und Continuo ist wegen ihrer Instrumentierung ungewöhnlich. Vivaldi hat zwei Melodieinstrumente mit völlig verschiedenem Charakter und weit auseinander liegendem Register ausgewählt. In einigen seiner Kammerkonzerte hat er eine ähnliche Gruppierung eingesetzt, beispielsweise in RV105, aber erst in dieser musikalisch stimmigen Sonate erforscht er den Tonumfang und die Klangqualität der beiden Instrumente gründlich. In Deutschland paarte Telemann auf ähnliche Art eine Altblockflöte und ein Fagott, allerdings in einem ausgewachsenen Konzert. Vivaldi hat sein Werk als viersätzige „Sonata da chiesa“ angelegt, aber es sind darin auch Elemente des Konzertstils vorhanden, vor allem im Gefüge der beiden Allegro-Sätze. Im zweiten der langsamen Sätze wird die Blockflöte als Soloinstrument eingesetzt und vom Fagott mit Arpeggiofiguren begleitet. Der Instrumentalsatz verlangt von den Solisten durchweg Virtuosität. In den Ecksätzen des Konzerts in D-Dur, RV94, für Altblockflöte, Oboe, Violine, Fagott und Continuo überlässt Vivaldi der Violine den Vorrang, auch wenn die anderen Instrumente, insbesondere die Blockflöte, ebenfalls eine solistische Rolle zu spielen haben. Die Soloepisoden des ersten Satzes stehen sowohl von der Besetzung her als auch rhythmisch und melodisch in lebhaftem Kontrast zueinander. Die erste gehört allein der Violine, während in der zweiten, von Einwürfen der Oboe und Violine abgesehen, die Blockflöte dominiert. Die dritte Episode teilen sich Violine und Blockflöte, und in der vierten spielt die Blockflöte eine lyrische „Kantilene“, begleitet von Geigenarpeggien. Die fünfte Episode rückt erneut die Violine in den Vordergrund, allerdings mit Tutti-Unterbrechungen. Der zweiteilige Mittelsatz ist der Blockflöte übertragen, deren expressive Melodie von Arpeggiofiguren auf der Violine begleitet wird. Der abschließende Satz beginnt mit einem energischen Violinsolo, aus dem sich ein kraftvolles Unisono-Tutti entwickelt. Je weiter die Musik voranschreitet, desto klarer erkennbar wird die virtuose Rolle der Violine.